Trying to be green and buy organic? Or maybe just trying to avoid all the chemicals use in food production? 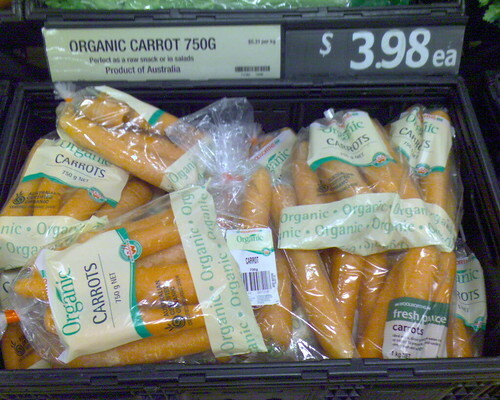 Doesn’t it seems just a little ironic to find your organic carrots are sealed in plastic? I suppose it is to keep them separate so they don’t contaminate all the ‘normal‘ carrots. This entry was posted in Photos, Shopping and tagged carrot, green, organic, photo, Shopping, Woolworths. Bookmark the permalink.